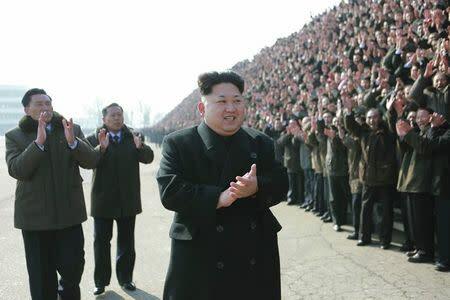 WASHINGTON (Reuters) - The United States is "deeply concerned" about North Korea's nuclear advances, a senior U.S. official said on Tuesday after a U.S. research institute predicted Pyongyang could possess as many as 100 nuclear weapons within five years. 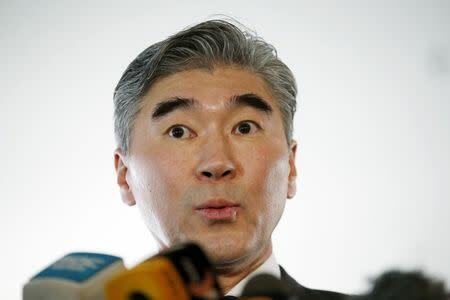 Sung Kim, U.S. Special Representative for North Korea Policy, told a Washington seminar he could not comment on findings presented earlier by experts at the U.S.-Korea Institute at Johns Hopkins University's School of Advanced International Studies, because he had not seen the report and U.S. government assessments were classified. "(But) obviously we are deeply concerned about the fact that the North Koreans are continuing to advance their nuclear capabilities; we know that they are continuing to work on their nuclear program," Kim said when asked about the report. Experts at the U.S.-Korea Institute presented three scenarios for North Korea’s future nuclear stockpile, which they estimated currently amount to 10-16 weapons. In the first, assuming minimal technological improvements, the stockpile was expected to grow to 20 weapons by 2020. In the second, it could grow to 50 and advances in miniaturization would allow North Korea to mount warheads on a new generation of intermediate- and shorter-range ballistic missiles. The report's co-author, Joel Wit, described a "worst-case scenario", which would see an increase to 100 devices and significant technological advances allowing North Korea to deploy battlefield and tactical weapons if it chose to. "This is a pretty scary scenario," Wit said, adding that the more nuclear weapons North Korea had, the more difficult it would be to try to coerce it to rolling back its nuclear program. The report said North Korea's existing missile systems were able to reach most of Northeast Asia, particularly its foes South Korea and Japan, and Pyongyang may also in the future be able to deploy a limited number of Taepodong missiles - a militarized version of a space-launch vehicle - that could reach the United States. Kim said concern over North Korean advances was driving international diplomatic efforts "to find a credible path to negotiation so that we can stop North Korea’s development of their nuclear capabilities." He said Washington was "under no illusions" about North Korea's willingness to denuclearize voluntarily and would "continue to apply pressure both multilaterally and unilaterally" though sanctions to increase the cost of failing to do so.